Rumors abound that White House press secretary Sarah Huckabee Sanders is considering leaving her position. 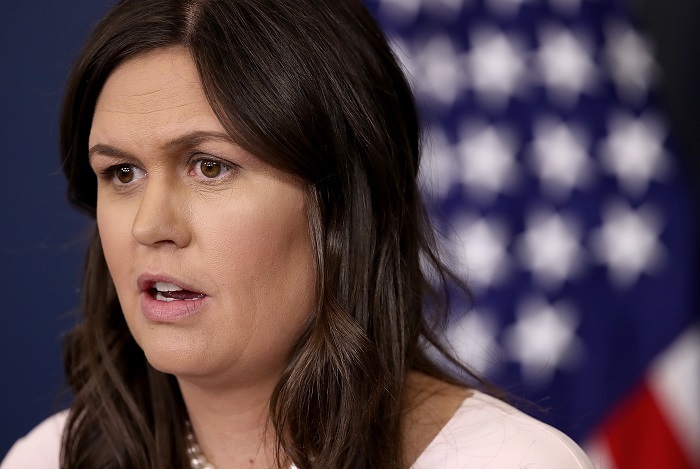 According to sources inside the White House, Sanders is planning her departure from the administration at the end of this year, after mid-term elections in November. Deputy press secretary Raj Shah is reportedly also looking into leaving the White House although without a clearly set timeline. Since this news story broke, Sanders has fired back via Twitter that she loves her job and is honored to work for President Trump. Nevertheless, she did not say that the news report is inaccurate. Shah has thus far not commented publicly on his future plans. Current turnover rate in the Trump White house stands at a record-breaking 51%. During Trump's first year in office, the turnover rate was 34%, which is four times higher than the turnover rate during Obama's first year in office. In fact, in just his first 14 months on the job, Trump had more Cabinet turnover than 16 of his predecessors over the last century had in a full 24 months. John Kelly, the president's Chief, has reported that the White House is a "miserable place to work" and is considering his own departure. If Sanders does leave her position, it would be a loss for the Trump who values her as a confidante. Many former White House press secretaries have noted that the position is particularly difficult for a president who is inconsistent and is estimated to make an average of six false statements per day. Sanders replaced former White House press secretary Sean Spicer, who resigned in July 2017. It is unknown who would take on the press secretary role should Sanders in fact leave the position.